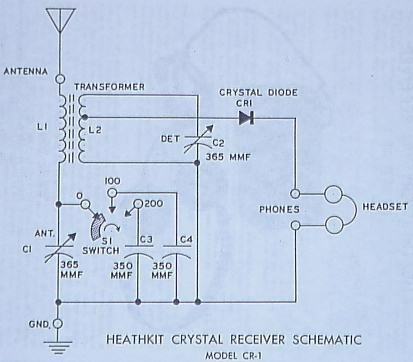 This page gives the circuit and pictoral description of the famous Heathkit CR-1 crystal radio. 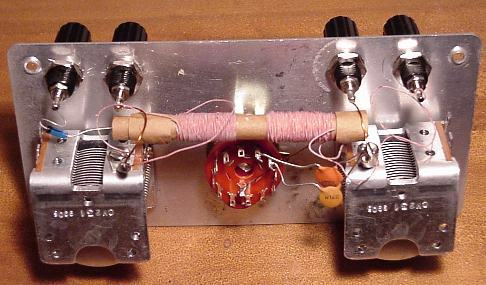 It was a double tuned crystal radio from the 1950's with a series tuned primary that had a 365 pf variable capacitor and selectable additional capacitance on the center selector switch. In my opinion, it would have been more logical to have made the center switch for varying the inductance and using a tapped primary coil. Here is a picture of the inside of the original CR-1. Another photo showing the inside of the original Heathkit CR-1. Note the rectangular pinkish mica capacitors, the configuration of the central antenna switch, the "cable knit" appearance of the coil windings, and the long screws holding the panel to the threaded stubs that are recessed deep into the cabinet. Anyway the coils, marked as "transformer" in the diagram, were both wound on a ferrite rod and the secondary coil was part of a tank with the 365 cap and the germanium diode for the detector circuit. They do not give details of the coil construction but with a little experimentation you can get into the BC band tuning range. In my first building project replica I used a toroidal core instead of a rod. An Amidon FT 114-61 was my choice for the core, and 45 turns of 24 GA enamel wire for the secondary gets the detector tank in the ballpark. (Amidon's webpage is http://www.amidoncorp.com). I used 30 turns of the same wire would on the same toroid for the primary with taps at 3, 6, 9 15, 24, and 32 turns. 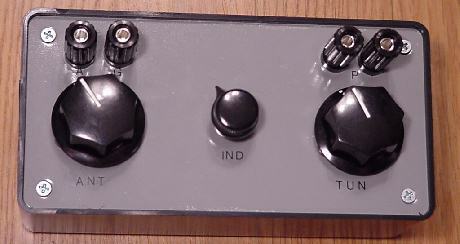 I used the center selector switch to vary the inductance of the primary instead of switching in additional capacitors. The little box is a Radio Shack part #270-1805 that is just about exactly the same size as the original enclosure. The front panel is made of aluminum, so it serves as a common ground, but the antenna and one of the headphone binding posts need to be insulated from it using little fiber washers to prevent those binding posts from making electrical contact with the panel. The radio was originally sold either with or along side a pair of 4000 ohm Trimm Acme headphones. They were only middle of the road for sensitivity and a good old pair of Brandes Superior or Western Electric 509-W's would be much more sensitive. Here is a shot of the main parts on the floor. 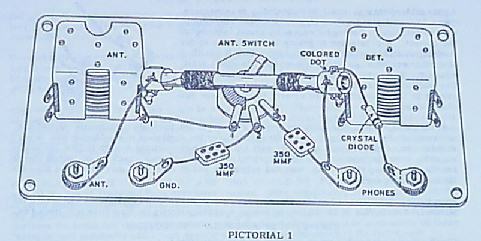 The rotary switch, diode, and box are from Radio Shack. The variable caps were obtained from the Xtal Set Society. The coil is described above and I got the old mica capacitors from my junk box. I ended up using a different coil and no padder capacitors though. One challenge was to tap a couple of the holes on the front face of the variable caps to allow them to be mounted to the front panel using 6-32 screws. Care must be taken to avoid damaging the capacitor and to keep the metal shavings out of the ball bearing mechanism. OK, here is the completed CR-1 clone. This first attempt has the binding posts spaced a bit too close. I didn't have an original to copy, just pictures. I also tried a couple of different coil configurations and the one I settled on has 45 turns of 24 GA wire for the tuned secondary, and the primary is tapped as noted above. Inside it is pretty simple. 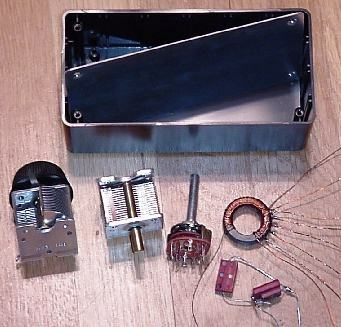 Just the 2 variable caps, the rotary switch wired up to the toroidal coil, and the diode can be seen from the capacitor to the binding post on the far left. I hooked it up and counted 6 local stations in the first minute in the daytime, and with a good pair of headphones got 7 locals and another 4 out of state stations on the first night. If I ever get a hold of an original, I will post a comparison of the performance. OK, I got a loan of the original Heathkit CR-1 and here is what I found. The original CR-1 has a much more definite double tuned effect than my spinoff. The 2 knobs for tuning the ANT and DET circuits seem to track pretty closely with each other and both need to be tuned to the same frequency farily sharply to get reception. It is easy to miss a station by not having the tuners coordinated. I found it best to move the DET dial a little then sweep the ANT knob back and forth a little to zero in on the station if there was one there. The circuit gurus emailed me and correctly predicted that my circuit would pretty much function as a single tuned circuit. The inductance tap switch mainly varied the selectivity and I found the 9 turn tap to be good for both sensitivity and selectivity. There was some noticeable tuning effect of the ANT variable cap at the high frequency end of the dial but the DET tuner did most of the tuning. It was, however, very sensitive and tuned very sharply anyway. In fact the volume was louder across the entire frequency range than the on the original CR-1, and I was able to get a couple of weaker stations that I couldn't reach on the real CR-1. So overall I am very happy with the performance but I will try another one to try and clone the coil and performance of the original a little more closely. After a lot of advice and many coils later, I think I got pretty close to the original performance. The secret is the coil. I am told the original has 2 small ferrite cores in it rather than 1 long one so, I experimented with different sizes of cores combined with different numbers of turns on the coil and then zeroed in on the correct spacing between the 2 cores. The spacing between the coils could be measured from outside but the stuff inside the cardboard tube was impossible to discover without damaging the coil. It looks like the core is about 1/4 inch diameter and extends just to the outer edges of the coil windings when you look into the ends of the tube. If anyone knows the exact original specifications please let me know. Anyway, I was able to pick up the same stations with this version as with the original. After many attempts and examination of an original coil and X-ray here is what I ended up with. I used 21/44 Litz wire for the windings. 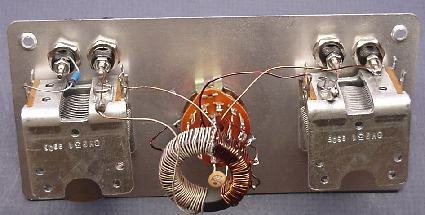 The antenna coil was about 140 turns with a 9/16 inch slug inside that part for about 335 uH inductance. The space between the coils was 10 mm or about 7/16 inch. 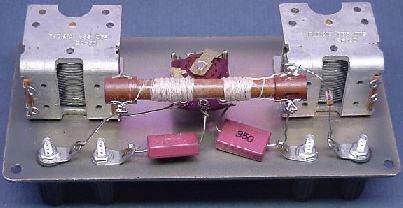 The detector coil had about 90 turns with a 9/16 inch long slug inside that and measured 240 uH. On some of the coils, I tried bringing out a tap about 30 turns from the stator end of the winding for the detector tap. Hard to say if this made and noticeable difference, not much if any. This coil seemed to duplicate the performance of the original in both sensitivity and selectivity. Any closer spacing of the coils and you get too much coupling and the tuning gets very broad. 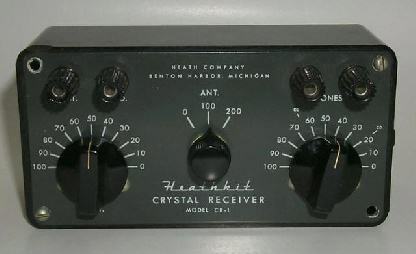 Here is a front label that I made on some thin acetate plastic, printed the Heathkit logo on it, and glued on to the front of the aluminum panel. I sold a few of these clearly presented as home made clones, though I have occasionally seen my radios show up for sale on Ebay advertised as a genuine Heathkit, which should be obvious that they are not. Note the short flat Phillips head screws, the lettering which is clearly different than the original, and the coil inside is clearly hand wound as opposed to the tidy machine winding of the originals. Also note the round modern ceramic chip capacitors and the multiposition switch. If you run across one of my radios being passes off as an original, you can refer the seller to this page, but the radio itself, unless damaged, should work just as well as the real thing, and there were only a dozen or so ever made, so they are quite rare indeed! 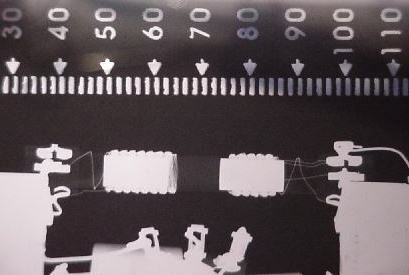 This is an actual X-ray of a Heathkit CR-1 coil. As you see, it has the 2 coils each with its own separate ferrite slug. The best I can measure, each slug is about 13 mm or about 1/2 inch long by 1/4 inch diameter. The separation between the slugs is 7/16 inch. It looks like the slug in the larger (antenna) coil is not quite centered under the coil. I am not sure if this was intentional or not. Anyway it was helpful to know how it was made so one might get a better idea of how to make a duplicate. The Amidon R61-025-400 core can be cut into the 1/2 inch lengths for use in constructing a coil like this one. I will post further information as I progress with this project. Thanks Mike! Link to Miller Tuner Page (sorry this linked site has been removed, but will try to relocate it) This is a link to a page with more information about another famous crystal radio, the Miller 565 / 595 Tuner. This was my next project. The modified schematic is shown below. The secret of this set is in the construction of the coils. L1 and L2 are straight ferrite rods wound with Litz wire. The best reproduction of this was to use an Amidon 2 inch by 1/4 inch diameter ferrite rod of material 61, and wind on 85 turns of Litz wire. I had some 21 strand by 44 GA wire and this worked well. I actually measured the inductance of the finished coils and adjusted the windings to get them exactly the same, to the uH, about 250 uH. L3 is the real secret of this set. After trying several different core forms for this, the best seemed to be a ¼ inch hardwood dowel about 2 inches long. Wind 2 strands of the 30 GA wire onto the form together, side by side, close wound for somewhere between 20 and 31 turns and secure. Take the left end of strand A and the right end of strand B and join them together for the bypass to the grounded capacitor. The remaining free ends go to the points indicated on the circuit. I am told you can get the actual flyer from the Miller Company. This circuit and the construction details are published in the Newsletter of the Xtal Set Society in a 2 part article starting in Jan 2002. You can see the construction details and alignment instructions there.